MILPITAS, CA -- (MARKET WIRE) -- July 8, 2005 -- The new HJ-150 is a true pocket scale with 150g x 0.1g capacity and resolution. 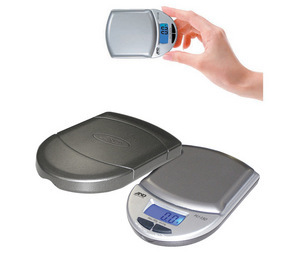 Unlike the other pocket scales on the market, the HJ-150 meets the quality standard required to carry the A&D name. The HJ comes with blue backlight, 100g calibration mass, 2 AAA batteries and weighs in grams or ounces. For use at home or industry the HJ gives portability and accuracy in the palm of your hand. A&D, an ISO 9000 certified company, designs and manufactures a complete line of viscometers, electronic balances, scales, weighing indicators and controllers for pharmacy, laboratory, food service and industrial applications, as well as advanced electronic blood pressure monitoring equipment for both home health care and professional markets. Founded in 1977, A&D is a multinational company with operations in Asia, Australia, Europe, Mexico and the United States.